Danella Yujuico Yaptinchay came back to the Philippines after nine years of living and studying abroad and started two companies dedicated to servicing the startup and entrepreneurial scene here in the country. She is managing director of a services company providing backend support to small businesses called Full Suite. Recently, she started a media company called Homegrown with some like-minded and awesome individuals, which produces multi-media content for and about startups in the Philippines. Although I like pampering myself, I usually go for the most straightforward routine possible with the most natural products I can find. Who doesn’t love a good shower? I am currently loving the coconutty-buttery smell of Organix’s Brazilian Keratin Therapy shampoo and conditioner — not to mention how great my hair feels when I dry it after washing. 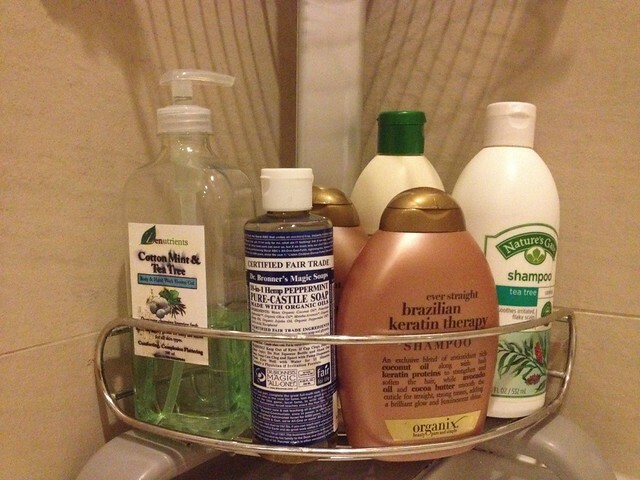 I also use Nature’s Gate Tea Tree shampoo and conditioner on some days to keep my scalp cool and soothed. For my body, I alternate between Zenutrients’ Cotton Mint & Tea Tree soap, which keeps me squeaky clean, and Dr. Bronner’s Pure-Castille Liquid Soap in Peppermint which leaves me tingly in all sorts of places (this is one of my all-time favorite products! Divasoria’s note – MY FAVE TOO!). 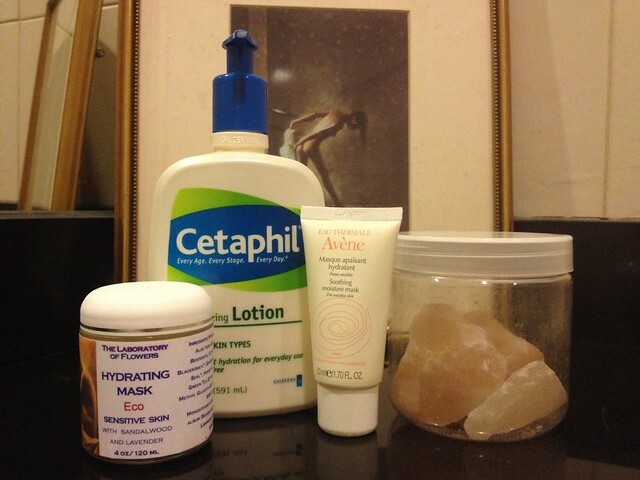 My skin is on the dry side, and Cetaphil Lotion does the job of keeping me moisturized after I shower. My other trick, which I discovered only recently, is taking Himalayan salt with my water daily. 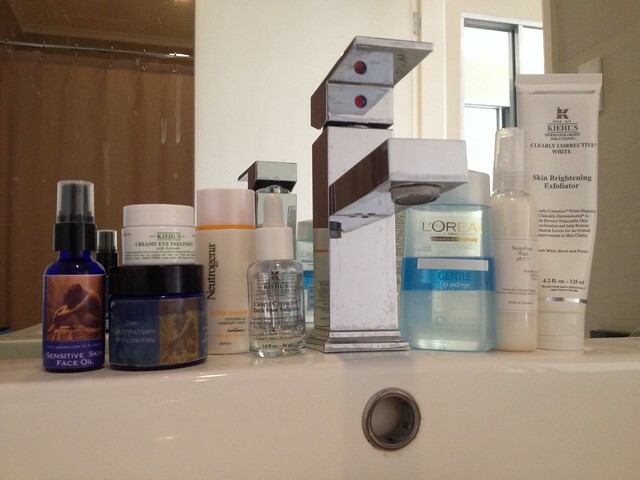 I noticed that my skin is so much more hydrated– my face feels so much more supple now than it did a few weeks ago. My secret weapons for dealing with irritated skin (face) are the Avène Soothing moisture mask (which I leave on at night, it just gets absorbed) and a Hydrating Mask for Sensitive Skin by The Laboratory of Flowers. The second one is from a line of essential oil products which I learned about from my aromatherapy teacher. When getting ready, my regiment for my face is fairly simple: I use the Creamy Eye Treatment from Kiehl’s then use Kiehl’s Clearly Corretive Dark Spot Solution for the areas kissed by the sun, after which a layer of Sensitive Skin Face Oil (at night) or Cream (in the morning), both from The Laboratory of Flowers also. Of course, I use sunblock every day. I like Neutrogina’s Ultra Sheer sunblock. I use the Kiehl’s Skin Brightening Exfoliator about twice a week to give my face a little scrub. At the end of the day, I remove makeup with L’Oreal’s Gentle Lip and Eye Makeup Remover and wash my face with a Soap-Free Wash I buy from my dermatologist. Makeup-wise, I get a lot of my tips and tricks from my sister Iya, who’s a makeup artist (check out her site: tintediya.com). 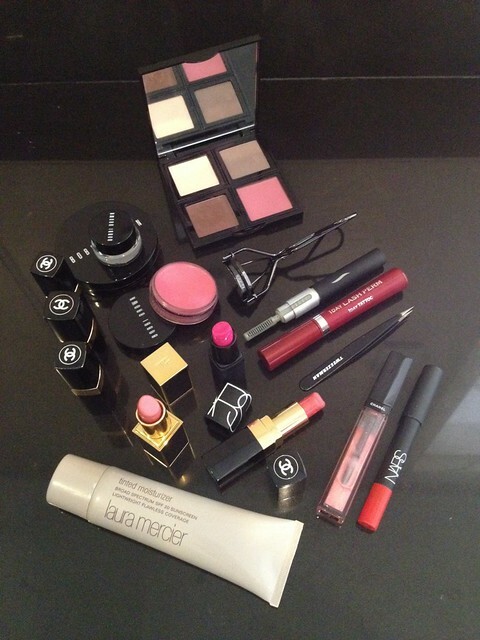 The products I can’t live without are my tweezers, eyelash curlers, mascara, blush and basic lipstick. I use Tweezerman to clean my brows in-between grooming from Browhaus. My eyelashes are very straight, so I use a Shiseido eyelasher curler specifically made for Asian eyes and/or a heated eyelash curler to keep them curled all day. I am addicted to this drugstore brand of mascara I bought in Japan called K-Palette 1 Day Lash Perm; I do use Maybelline mascaras as well. 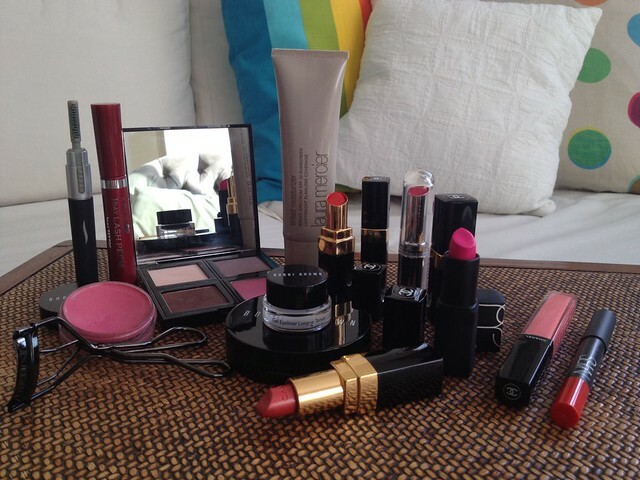 For blush, I’m currently using the Bobbi Brown Pale Pink Pot Rouge for Lips and Cheeks — it stays on all day! My absolute favorite lipstic is Antigone from Chanel’s Rouge Coco Shine line. It’s very, very light and natural-looking. When I’m feeling blah, I use Laura Mericier’s Tinted Moisturizer to even out my skin tone and bring some color to my face. I also use Bobbi Brown Bronzer and some eye makeup, but you can see from my palette that the colors I use are very basic! I use the Bobbi Brown Long-wear Gel Liner in black to help enhance my eyes. I try lipsticks from time-to-time, but I can’t use the matte or heavier colors very often because my lips chap very easily. Currently in my stash are Chanel, Tom Ford and Nars. I get my nailpolish influence from my sisters. My staples are the Chanel and Essie lines, along with Seche Vite for the base and top coats. I am very sensitive to smells, and like the lighter, cleaner scents for myself. My all-time favorite scent is the Green Tea with Mint fragrance from L’Occitane — problem is, it’s been discontinued so I’m rationing it! The close backup for this is L’Occitane’s Eau Universelle . 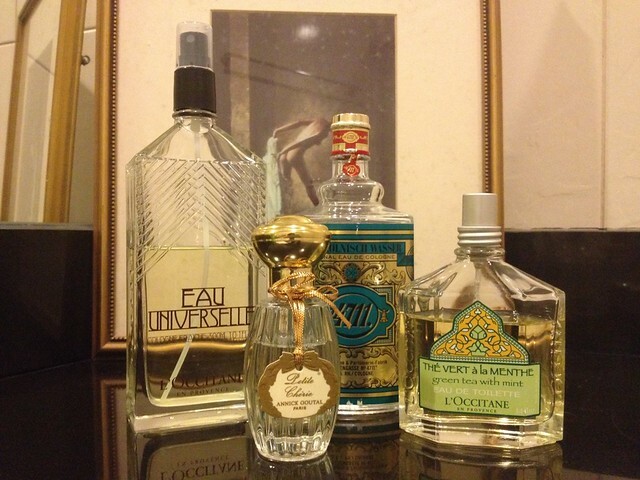 I also use 4711 as a nice day fragrance and Annick Goutal’s Petite Cherie for the evening. *Danella is wearing a dress from Exhale Manila – Check them out!